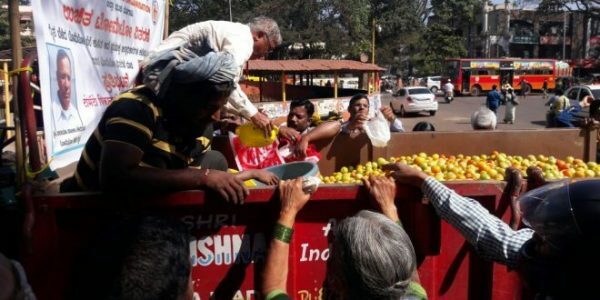 With the wholesale price of tomato falling to an all time low, the farmers are now forced to dump it or a few like Narayan Patil distributed the tomatoes for free at the DC compound. As a mark of protest farmer Narayan Patil brought the tractor laden with tomatoes to the DC office and shouted that it was for FREE and in minutes the tractor was empty, but the buyers did not realize or want to realize why this farmer was doing this. With no support price mechanism in place and when prices fall farmers are forced to dump their produce. Really very bad to know this. We the citizen should try to help farmer in such situations & make them earn some amount for their product. He must be a rich farmer. A poor would not have done this. A poor farmer would have died by getting such low price. It is a way of protest. Instead of throwing the produce atleast he donated. Think before you comment and don’t comment on topics you know nothing about.